There are so many cute and fun crafts to make with baby and child handprints and footprints, it’s hard to know where to start! Here are just few examples. Please send yours in to footprinter@babyfootprints.info and we’ll post them here, too! Below you’d see a deer made from a paper bag and cut-out child handprints–great for Christmas. There’s artwork using paint, child handprints and pipe cleaners. 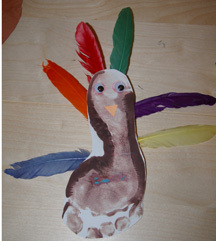 And check out this new twist on the old turkey handprint: feathers! Also, you can use white paint to make a child’s footprint into a fun ghost for Halloween. Here are links to the footprint ghosts and also handprint spiders on our sister site, www.freepreschoolcrafts.com.